As Totem Travel’s Europe Specialist I have had the pleasure of traveling to many wonderful places and one of my favorites is Ireland. When you think of Ireland, what do you think of? I think of Kissing the Blarney Stone, beautiful stone churches, mythical stone circles and colorful green fields as far as the eye can see. Another thought is Castles! Picture a fairy tale castle with long winding drive up to the castle gates as the road passes an enticing blue lake and glistening green fields. On the slope just as you ‘round the bend is the castle! It is a slate grey stone fantasy which stands out from the greenery that surrounds it. As you enter, the stained glass windows on each of side of the entrance along with the knights armor standing against the wall adds character as well as charm to the place. Period furniture, oak paneled walls, and a 2 story high lobby with crystal chandelier complete the picture. Which castle is being described? All of them! But the castle in question is none other the Dromoland Castle about 20 miles from Limerick. Many people visit Ireland but I daresay not enough actually spend the night in a castle. In my opinion is the best way to experience Ireland. You are immersing yourself in the myth, the history and the people. Plus the people who work at the castle estates usually have worked there for years and can enchant you with the history of the area. Why Dromoland Castle? Location, location location! With its location in the countryside outside of Limerick you are a stones throw from the airport in Shannon which makes getting to the castle a breeze. Plus you’re a short drive from the Ring of Kerry and the charming town of Killarney, Galway and the Cliffs of Moher. 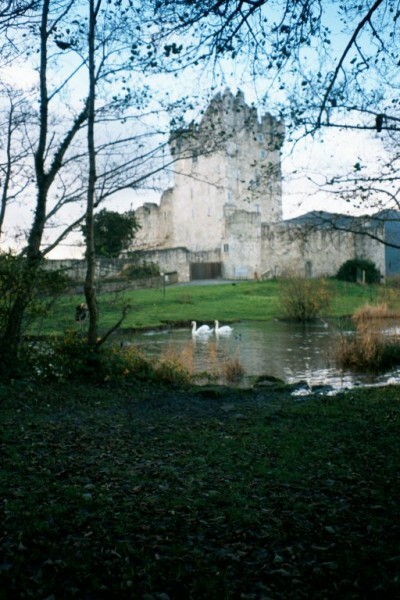 In Shannon, Clare and Limerick which are the surrounding towns around the castle there is traditional music and entertainment all year round in the many pubs as well as in the captivating capital- Dublin. Ahhh Dublin! It’s perfect for those people wanting museums, pubs and history. It’s humming with activity and gracious people. No need to rent a car while visiting Dublin. It has easy train access from the airport to downtown. I have never strolled through a more walking friendly city. The walk along the River Liffey is beautiful and colorful. You will have strangers stopping you and asking you if you need help with directions instead of you asking them. Along with those directions you will probably get a story about Dublin itself. Ireland truly does have the friendliest folks anywhere! If Castles are not something you would consider you can always choose to stay at a traditional Irish hotel or Inn or include a few days in Ireland on a multi country escorted tour. Treasures of Ireland is a favorite tour of mine but there are many more to choose from including Contiki tours for 18-35 year olds, and Globus escorted tours of Ireland. Please call or email me to plan your vacation in Ireland. I can’t wait to show you the magic!